The Scotch Game (1.e4 e5 2.Nf3 Nc6 3.d4) is a lively alternative to the Ruy Lopez which has found favour amongst many leading Grandmasters. The top experts in the Scotch include former World Champion Garry Kasparov as well as Alexander Morozevich, Sergei Rublevsky and others. The space White takes early in the game can easily translate into a powerful attack against Black’s king. 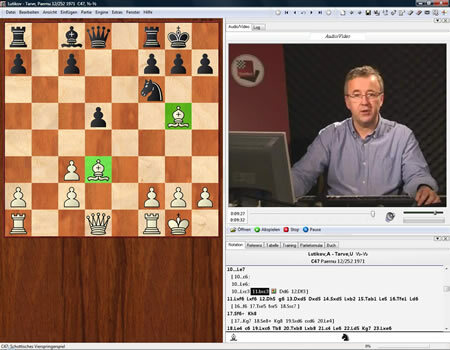 In addition to this White can often usually some damage on Black’s pawn structure by capturing Black’s knight on c6. These dual aims have certainly been giving Black plenty to think about. 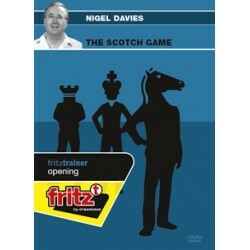 On this DVD Nigel Davies introduces the viewer to the Scotch and first shows an easy way to get on board this opening via the Scotch Four Knights (1.e4 e5 2.Nf3 Nc6 3.Nc3 Nf6 4.d4). He then goes on to show how this can be built into a World class Scotch repertoire in which Black has more options but also comes under more pressure. Whilst the presentation is focussed mainly on those who wish to play White, Davies also suggests lines for Black. This makes it essential viewing for players wishing to play either colour. Video running time: 5 hours.